Several of the colours Chant and his colleagues desired in the reproduction were not best reproduced mechanically through the photo-chemical half-tone process. It was decided to execute the stars in white, white and gold, and the meteors in gold individually by hand for every single copy of the Journal as the penultimate stage in production prior to tipping-in to the binding. A careful examination of different copies of the print shows that while the general placement of the meteors and stars is quite close, as are their shapes, they are far from identical from print to print. This seems an extravagant way to mass-produce an image now, but it must be remembered that features added by hand were part of the printing industry from the 15th to the early 20th century, chiefly in the matter of colour . The use of the technique for reproducing Hahn’s GMP image occurred within the context of a venerable industrial practice - JRASC 105, 4: 173. The image is as evocatively memorable now as when it was first published. 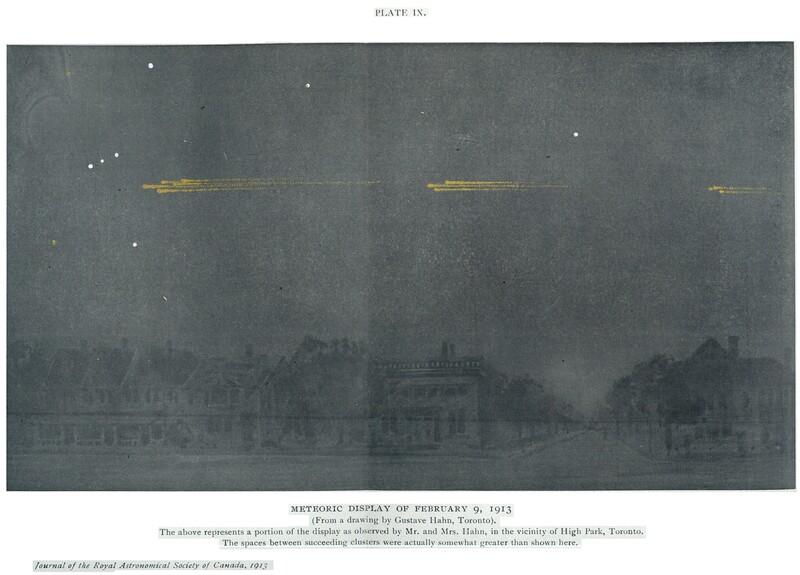 Nearly a century ago, the Great Meteor Procession (GMP) was spectacular enough to surprise, delight, and awe the most experienced of meteoriticists, not to mention the casual observer. The same event would doubtless have a comparable impact today.